SAN FRANCISCO -- The Indiana Pacers averted what would have been a disastrous 0-2 hole and destroyed to the Atlanta Hawks, 101-85, in Game 2 of their Eastern Conference quarterfinals Tuesday night at the Bankers Life Fieldhouse. After a disappointing Game 1 loss, Paul George played with a purpose and collected 27 points, 10 rebounds and 6 assists. Luis Scola had a solid 20 points while George Hill finished with 15 and four assists. The Hawks took a 52-48 halftime lead and appeared headed toward another huge road win, but the Pacers responded with 31-13 third quarter explosion to take a 14-point advantage entering the fourth stanza. Indiana was never threatened from that point on. Now tied at 1-1, the best-of-7 series shifts to Atlanta for Games 3 and 4 beginning on. Thursday night (Friday AM in Manila). 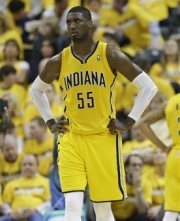 Photo: Center Roy Hibbert was a non-factor again in Game 2 but the Pacers survived to even the series at 1-1.